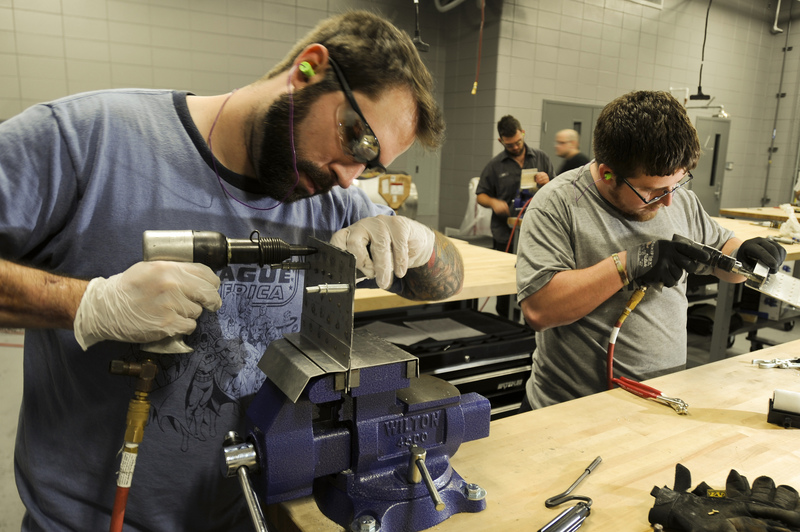 Aircraft Technology offers several programs that prepare students for careers in Aircraft Structures manufacture and repair, Luxury Craft Cabinetmaking, and Aircraft Upholstery and Trim. Aircraft Technology courses are offered at Crossroads Campus. Aviation Maintenance offers degree, diploma and certificates. The Aviation Maintenance degree provides students with an introduction to aviation maintenance as currently understood and practiced by Federal Aviation Administration (FAA) mechanic certificate holders with airframe and/or powerplant ratings. In addition, the combined powerplant and airframe curriculum provides technical knowledge and skills required to diagnose problems and repair aircraft powerplants, both reciprocating and turbine, their systems and components; and airframes, both metal and wood, their systems and components. Satisfactory completion of all program courses entitles students to participate in FAA powerplant and airframe examinations and certification processes. Most employers require the FAA Mechanic’s Certificate with Airframe and Powerplant ratings to be able to work on aircraft in the Aviation Maintenance field. These exams are not part of the program or cost of the program. Aviation Maintenance is only offered at Crossroads Campus. The Advance Aviation Maintenance Certificates are designed for those individuals who have met the requirement of Federal Aviation Regulation Part 65, Subpart D. The individual must have completed FAA Form 8610-2 in which block V has been signed by an FAA inspector or must have a graduation certificate or certificate of completion from a certificated Aviation Maintenance Technician school. At the end of each class the student will take the FAA written exam that goes along with that area (i.e. General, Airframe, or Powerplant) and that will count as their final exam for the class. The cost of the exam is not part of the college’s tuition and fees for the class and must be paid separately. After successful completion of the program, students must still successfully take the Oral and Practical part of the FAA Mechanic’s test to earn their FAA Mechanic’s Certificate with Airframe and Powerplant rating. This cost for the Oral and Practical is not part of the cost of the program. Advance Aviation Maintenance is only offered at Crossroads Campus. Would you like more information on our Aircraft Technology or Aviation Maintenance Programs? Please visit our Informational Session Schedule and call today to make an appointment. Potential students will learn about the program and admissions requirements, deadlines, and Financial Aid. Sessions last approximately one hour.